When it comes to designer bathrooms that make a real statement, a wet room is hard to beat. With its minimalist design and clean, tiled surfaces, a wet room can look simply stunning, even in the smallest of bathrooms. So, if you're looking for some superb wet room ideas, you've come to the right place. Before looking at some creative wet room designs, let's first debunk some myths around wet rooms. Many people are put off the idea of a wet room because they feel replacing their bathtub with a shower room will make it harder to sell their property. But do you really need a bath to sell your home? Are you actually planning on moving out any time soon? Did you know a professionally-fitted wet room can actually increase the value of your property? Another reason many people shy away from installing a wet room is the thought that it might leak. The idea of a room directly above your head where water cascades directly onto the floor can fill you with dread. However, a wet room is purpose-built to contain and channel water, something a regular bathroom isn't exactly designed to do. By waterproofing your bathroom and creating a wet room, you actually drastically reduce the risk of leaks. Finally, the cost and perceived difficulty in installing a wet room is another reason why many don't consider it. However, a purpose-built shower room is easier and cheaper to install than you'd think, adding value in the long run. You can even follow our step by step guide with video on how to install a wet room. So, to give you some great inspiration here are 4 great wet room ideas for you to try. We just love this wet room idea from customer David Francis of Gateshead. He's cleverly used the space in between the toilet and bath to create a stunning wet room space and shower area. Having divided the bathroom into 3 distinct spaces, there is still the option of a bathtub, meaning 2 people can share the space when showering and bathing. A recess or alcove in your bathroom can be put to great use by creating a shower area. 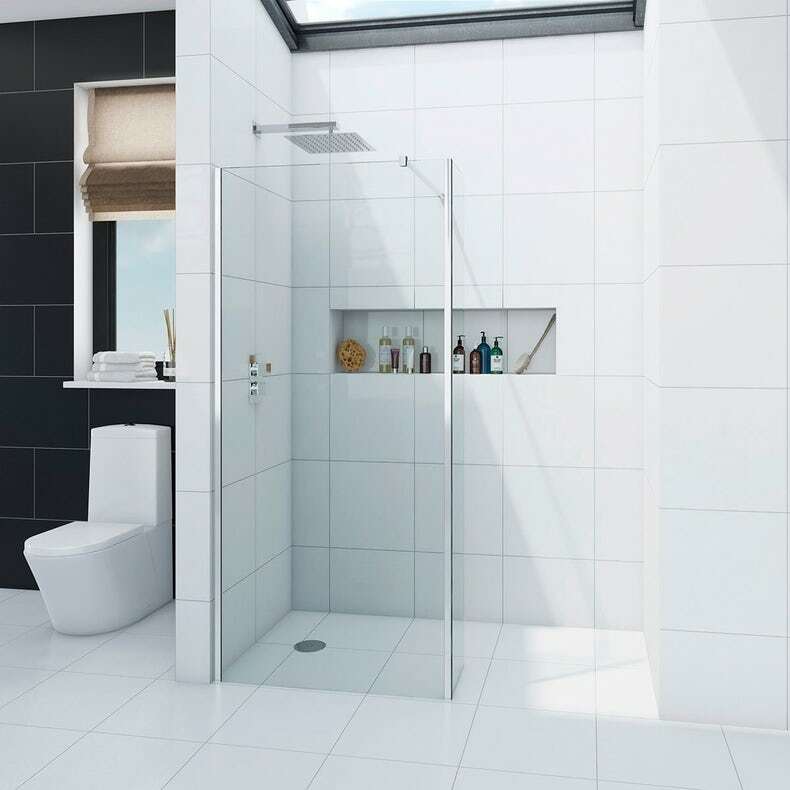 But instead of opting for a conventional shower door and tray, why not splash out a little and invest in a wet room? Simply fit your wet room waste and tray, along with tiling and add a glass screen to create a stylish shower room. It's that simple. 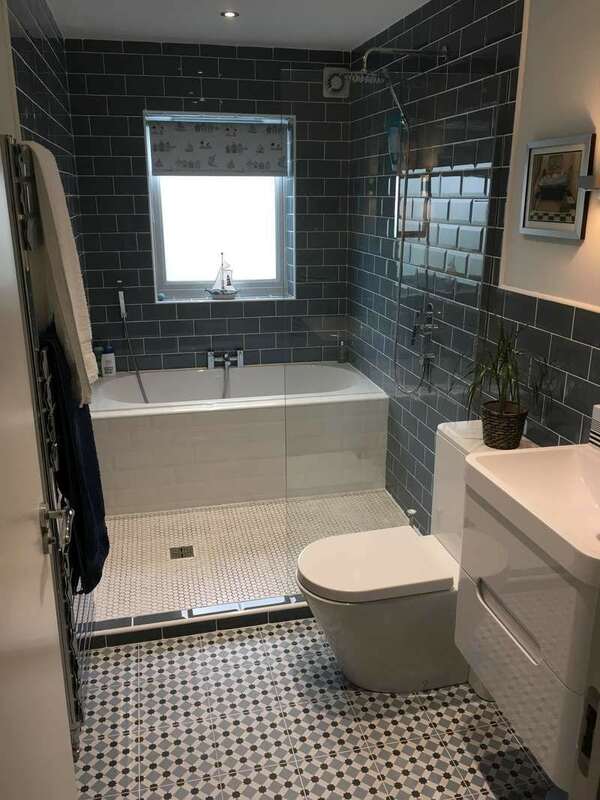 This stunning wet room was designed by customer Susie Stocks from Herefordshire and looks every inch the stunning bathroom decor she had hoped for. Whilst Susie may have the luxury of a large space to work with, she has found room for a vanity unit, luxurious freestanding bath, and of course, the wet room shower area. Proving that you don't need a massive bathroom when it comes to installing a wet room, this design uses a simple screen, return panel and an added end panel to keep splashes and spray firmly in check. 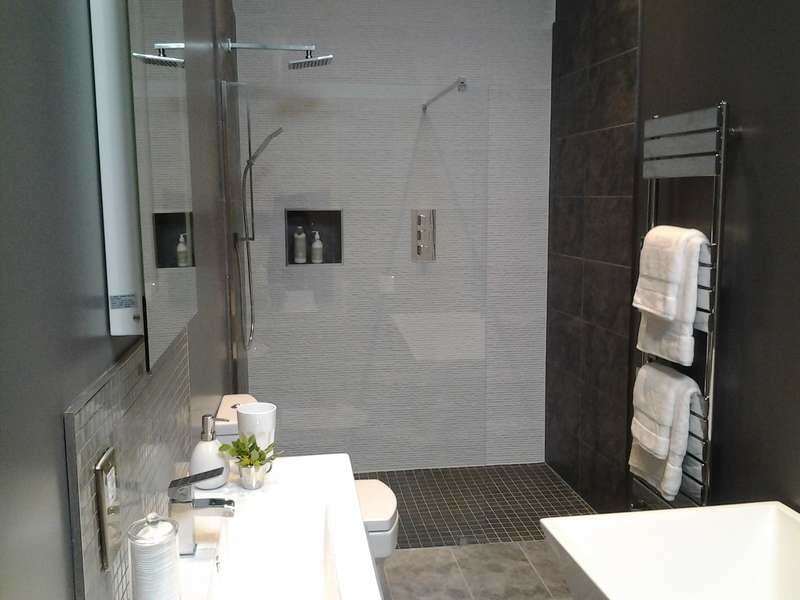 There is still space for a toilet and basin suite, and this stunning shower room feels much more open and spacious than it might with a regular shower enclosure. Contemporary bathroom suites go perfectly with this type of design. Looking for further inspiration? Check out even more walk in shower and wet room ideas. If you've decided a wet room is the best option for you, why not browse our comprehensive range of wet room bathrooms? A wetroom is the ultimate in luxury bathroom design, creating a calming, spa-like space you can enjoy every day. 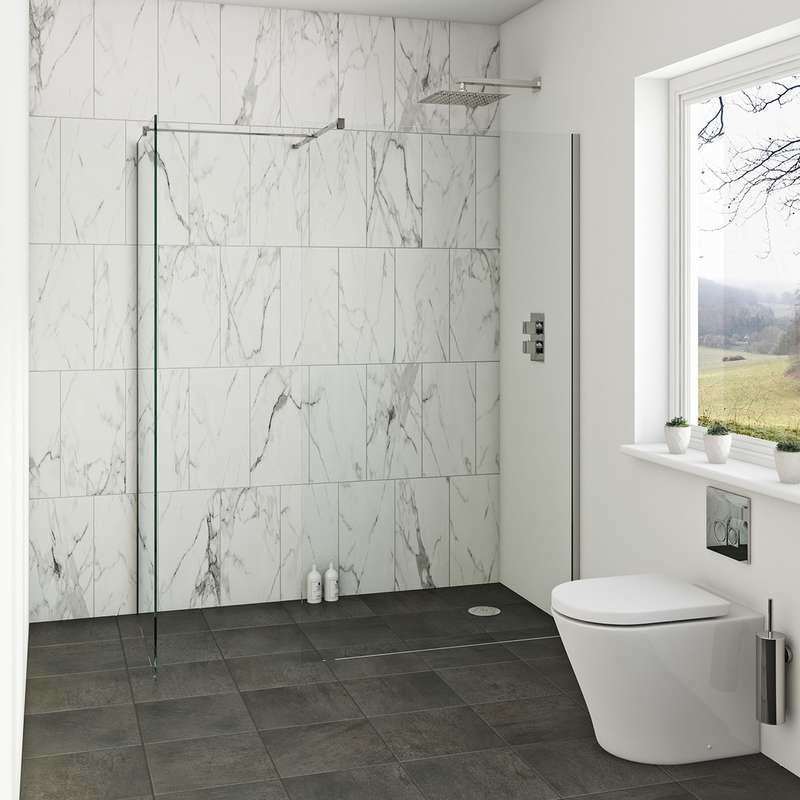 This guide will explain the basics about buying for a wetroom, and what products are available at VictoriaPlum.com, so you can create your own bathroom paradise. Turning your bathroom into a wet room, or installing one in a separate space from scratch, can be relatively straightforward as long as you plan everything in advance. With a handy step-by-step video, we'll show you how to install a wet room professionally, adding value to your property.